The World Wide Web has many birthdays. March 1989, when Tim Berners-Lee handed his boss a short document entitled Information Management: a Proposal, is one. 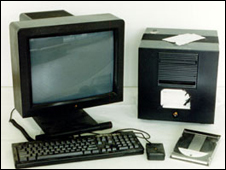 Christmas of the following year, when the Web was up and running on two computers, is another. But perhaps the most important Web anniversary of all is 30 April 1993. That's the day that Cern put the web in the public domain, thereby ensuring that the world would have a single system for accessing the Internet, instead of a Microsoft Web, a Macintosh Web and who knows, perhaps even an Amstrad Web. Today, it is hard to imagine a world without the web, yet well into the 1990s, internet access was the reserve of the privileged few, mainly academics. Although the internet had been around since the 1970s, accessing documents on remote computers required the mastery of complex protocols. Scientists had been doing that for years, and at Cern, the European laboratory for particle physics in Geneva, they were particularly adept. To most at Cern, complex protocols were just fine, but to Berners-Lee, there was clearly a need to manage better the digital information available in various databases and distributed across a plethora of computers at Cern and its collaborating universities and research centres around the globe. Hence the web's March 1989 birthday. "Vague, but exciting" were the words that Berners-Lee's boss, Mike Sendall, scrawled across the top of the proposal document as he encouraged his protégé to continue. The following year a less vague, but equally exciting, proposal ensued, and Sendall was persuaded to buy two shiny new NeXT computers for Berners-Lee to work on. In September 1990, they arrived, and by Christmas, the World Wide Web as we know it was up and running with its defining features of the URL, the hypertext mark-up language (html) and the hypertext transfer protocol (HTTP) all fully defined. Birthday number two. 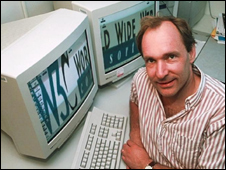 Berners-Lee's first browser was every bit as powerful as any modern day product, more so in some ways since the web was originally conceived as a two-way medium: Berners-Lee's browser was also an editor. There were snags, however. Firstly, the idea of a browser/editor was difficult to implement, and it's only now with web 2.0 that the web is becoming an interactive medium. Data sharing technology has a great future. It has come this far in 15 years, who can predict what is next? More fundamentally, however, the original browser only ran on NeXT computers. To see it in all its glory, people at Cern had to visit Tim Berners-Lee's office, and as Sendall later remarked, that was hardly the point. In the early 1990s, Tim Berners-Lee was not alone in thinking that the time was ripe for a new method of accessing information on the internet. The amount of information available, coupled with the fact that the desktop computer was fast becoming a fact of life for increasing numbers of people, persuaded many that some kind of Internet GPS system was needed. Systems with names like Archie, WAIS and Gopher sprang up and briefly shone before being eclipsed by the World Wide Web. Of these, Gopher was the most successful, with Gopher conferences attracting hundreds of delegates. Gopher was the product of IT professionals at the University of Minnesota, an institution that took a very business-like approach to the development. In spring 1993, the University started charging for Gopher servers while still distributing the browsers for free. That's a successful business model today, but the world wasn't ready for it in 1993. The day that Gopher stopped being free is the day that the web started to take over. In 1994, Gopher grew at the seemingly healthy rate of 997%, but the same year, the Web grew by 341634%. The declaration signed by Cern directors in 1993 which made the web free to use. The difference was a simple piece of paper that CERN issued on 30 April 1993, putting the Web in the public domain. Simply stated, that meant that Cern renounced intellectual property rights to the web, but that no one else could claim them either. The following year, Berners-Lee moved to Boston to take up the role of Director of the World Wide Web Consortium, set up by MIT as a global standards body for the web. W3C, as the consortium is known, has the job of ensuring that whatever computer, whatever server and whatever browser you choose to use, the web will still look the same. Cern's apparent altruism is deeply embedded in the organization's culture. Founded in 1954 by 12 European countries, Cern exists to carry out fundamental, curiosity-driven, research. Its product is knowledge about the Universe, the particles of which it is composed and the forces that give it structure, and it is mandated by its founding convention to publish or otherwise make generally available the results of its work. In putting the web in the public domain, Cern was only doing just that. The world's first web site, http://info.cern.ch, is still up and running. Though the content might have changed, it's still as good a jumping off place as any for a hyperlinked trip around the World Wide Web, whichever of the web's birthdays you might choose to celebrate. James Gillies is the co-author of How The Web Was Born: The Story of the World Wide Web, with Robert Cailliau.